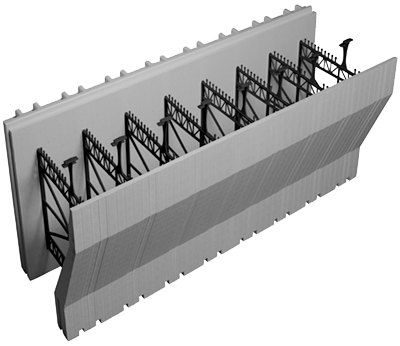 The Advantage ICF System Brick Ledge Block features a continuous uninterrupted concrete ledge. When brick ledge blocks are included in any ICF system horizontal steel reinforcement and stirrups are required in the concrete ledge portion to support loads. The Advantage ICF Brick Ledge Block features a web unique to the ICF industry that is molded into the EPS panel that forms the brick ledge. Attachment surfaces on internal webs within the EPS panel are consistent to the top of the ledge for easier fastening of required exterior finish materials to, a benefit only provided by the Advantage ICF Brick Ledge Block.